Euronaval 2008, a biennial event of ‘International Defence and Maritime Exhibition and Conference’, is presently going on at Paris. The 21st edition of Euronaval is the world’s leading trade show for naval defence and maritime safety. The first trade show started in 1968 as an exhibition of equipment for naval forces by French exhibitors. Later in 1994, the scope of the exhibition further expanded to include participation of European exhibitors and was called as ‘Euronaval’. From 1996 onwards, Euronaval has become an international event. Euronaval 2006, was attended by 31,090 professional visitors and 85 official delegations. 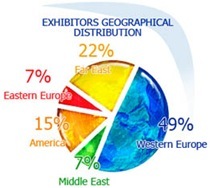 Products and services of 345 exhibiting companies from 27 countries were displayed. The event has started on October 27. To conclude on October 31. For more information, log on to Euronaval. On the occasion of the international exhibition Euronaval 2008, Italian ship builder Fincantieri has announced that the company has gained an order to build a fleet tanker for the Indian Navy. The vessel, to be delivered in 2010, will be built at the shipyards in Liguria. The vessel will be 175 metres long, 25 wide and 19 high and will have a displacement at full load of 27,500 tonnes. The ship will be powered by two 10,000 kW diesel engines which will enable it to reach a maximum speed of 20 knots and its propulsion system will feature an adjustable blade propeller. There will also be a flight deck on board for medium-heavy helicopters (up to 10 tons). In 2007, Fincantieri delivered “Sagar Nidhi” to India, an oceanographic vessel for the National Institute of Ocean Technology (NIOT) in Chennai. Also, in 2004 the company drew up two contracts with Cochin shipyard regarding the design of the engine, technology transfer and the provision of complementary services for the construction of the Air Defence Ship (ADS).